In the past week, the backyard has become the focus of attention. The stars finally aligned and our neighbor, Ken, was able to find a bit of free time to dig our new sewer line with his backhoe. The challenge was that the county sewer line is in the middle of Silver Street and we had to get there without digging up the pavement. 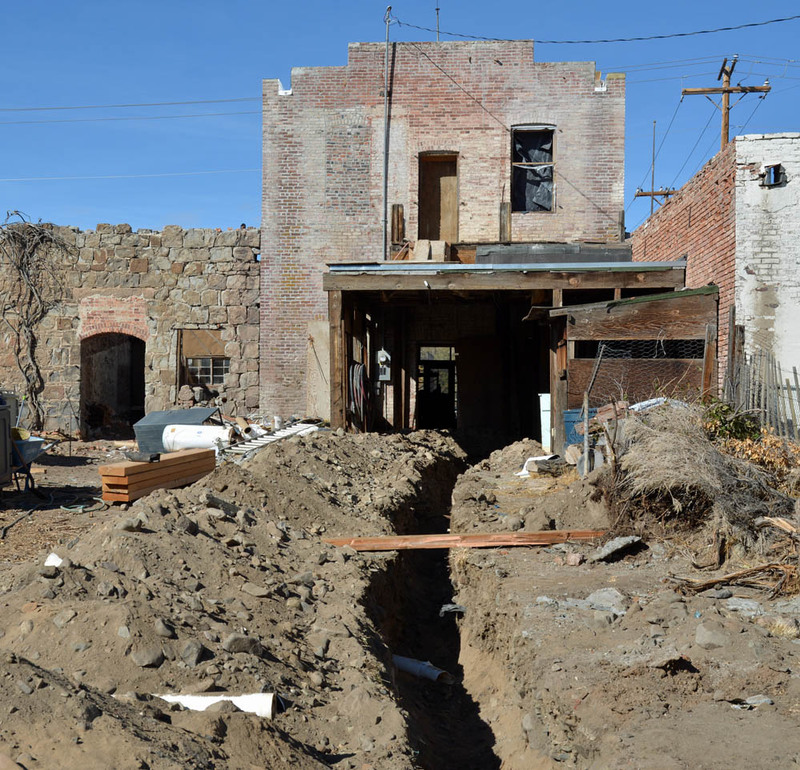 As luck would have it, we ran into a couple of generations of old sewer line while trenching toward Silver Street and this helped us confirm the best path through the yard. 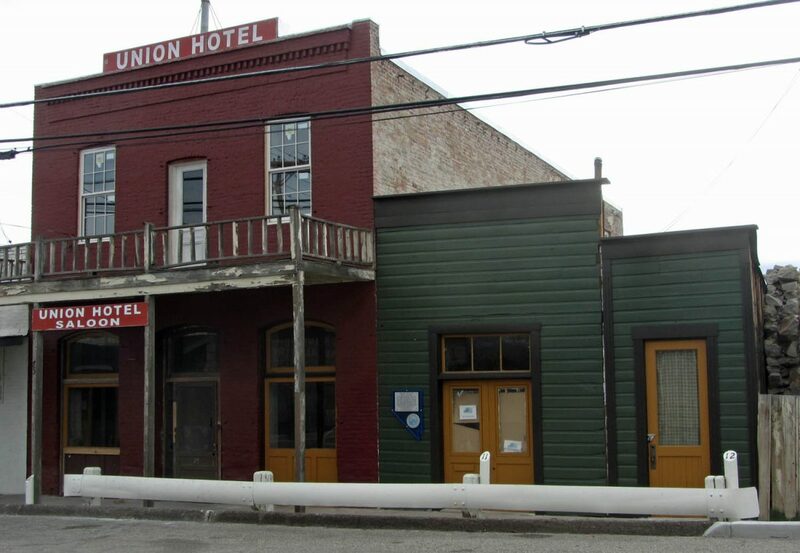 The clay pipe was probably installed in the 1920s when the hotel got plumbing for the first time. It was later abandoned and replaced by a more modern plastic pipe that ran along side of it. We stumbled across the plastic pipe about half way to Silver Street and we removed most of it. Where we got lucky was at the edge of Silver Street. The plastic pipe continued out under the street to connect with the county sewer and it had a nice slip coupling right on the property line. This will allow us to neatly connect our new sewer line to the county with less digging than expected. Now, you would think that with all the digging, we would have found a bottle or two. We didn’t, of course. 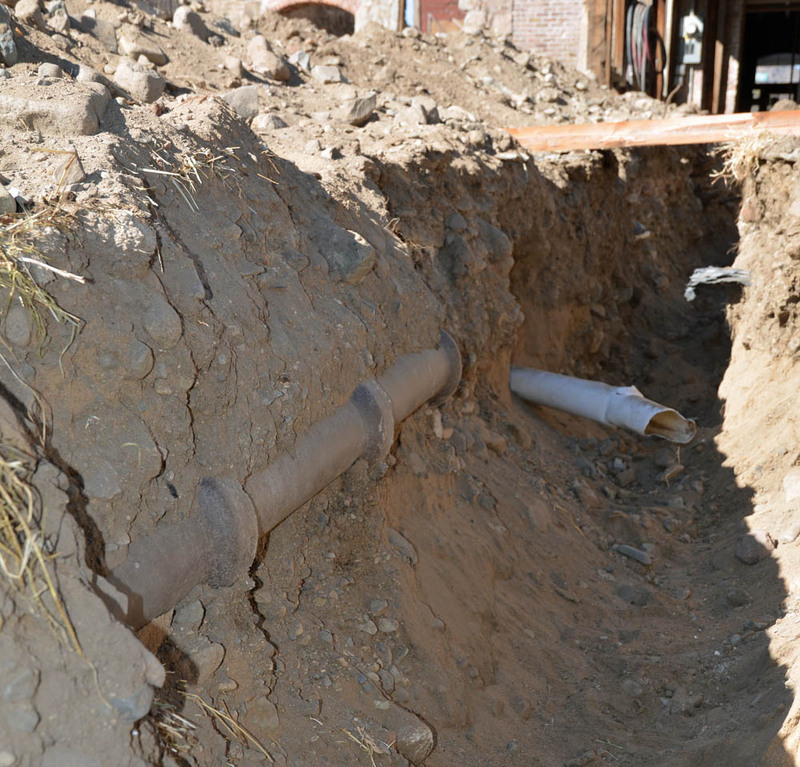 It was obvious that when the ground had been trenched for the earlier sewer lines, anything of interest had already been removed. This was disappointing but there was another project that proved to be more interesting. There used to be a brick path in back of the hotel and from this, I was harvesting period bricks to use as thresholds at the front of the saloon. 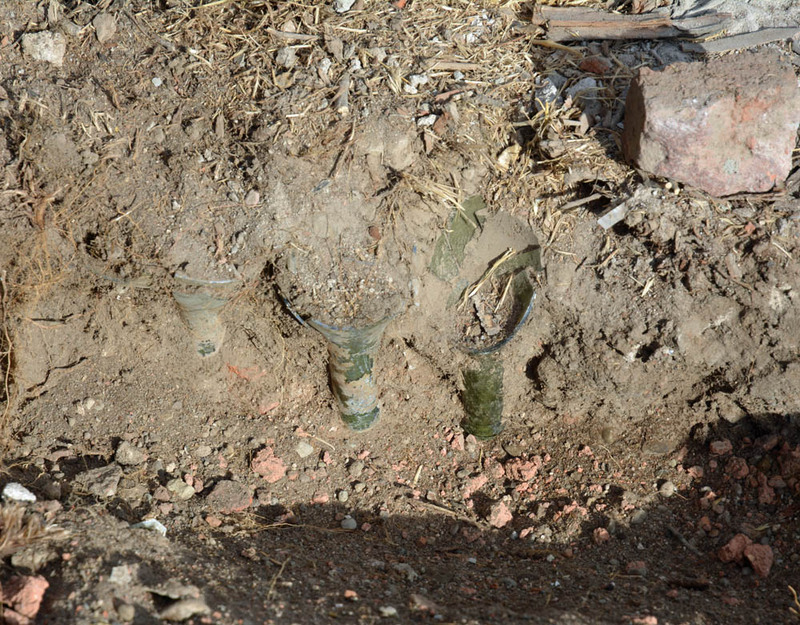 While pulling the bricks loose from the ground, I noticed a lot of green glass fragments in the soil. 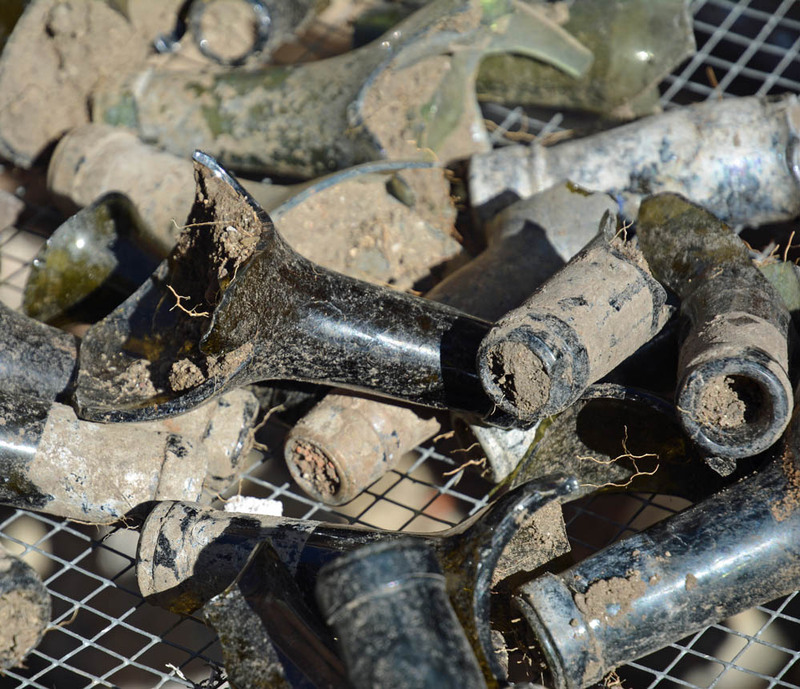 These turned out to be from several dozen blown glass wine bottles that were inserted neck down all along the edge of the path. They were all broken, of course, but still fun to rescue and speculate about what they were doing there. I suspect that it was a decorative touch from the late 1800s. Now, they will be cleaned up and strung together as fence ornamentation like I’ve seen in Gold Hill and Virginia City. The new roof is finally getting installed and Katie and I are proceeding with prep work for the new windows. This includes removing the old rotted windows which uncovered a new challenge. The brick work around the windows has suffered quite a bit of damage over the years and there is nothing in the budget for repair; as a result, I’ve now become a budding mason. 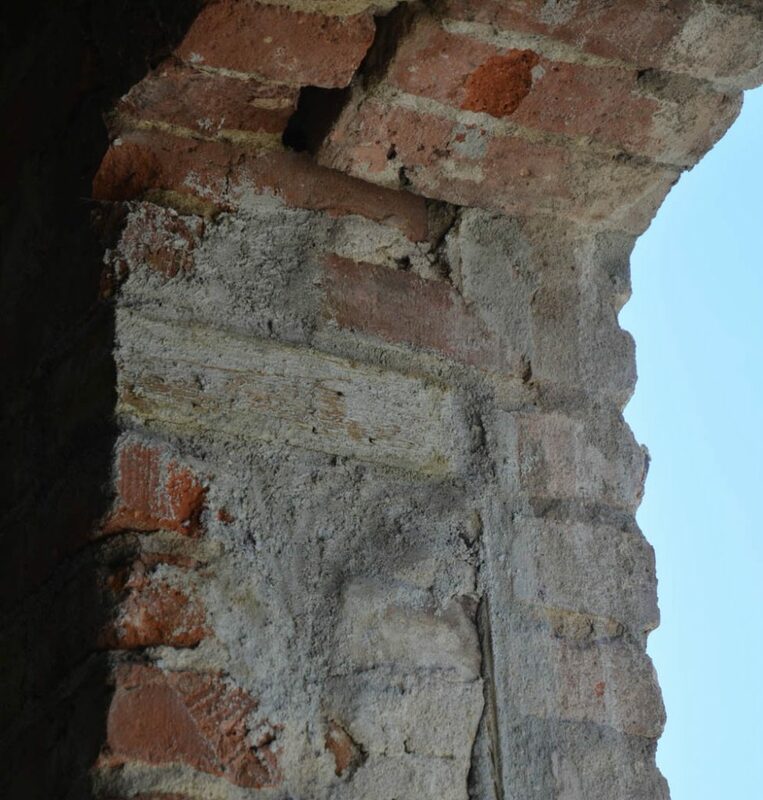 Almost every window has seen quite a bit of water infiltration over the years and this would not have been a problem if the brick work was more modern. 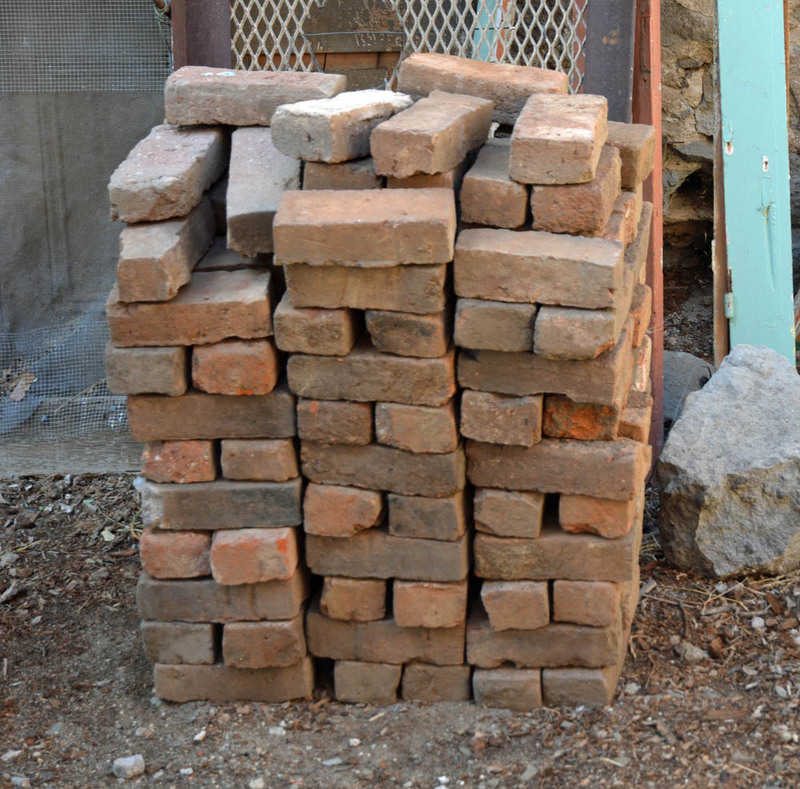 These old bricks, however, were not fired as evenly as newer ones and they vary in hardness by quite a bit. Some are hard enough to daunt a concrete drill while others crumble with the least bit of stress. The mortar is also quite antiquated in that it is probably just lime and sand which looses its bonding ability after many years. Many of the bricks just lifted right out or their mortar bed as if they were just sitting in dry sand. 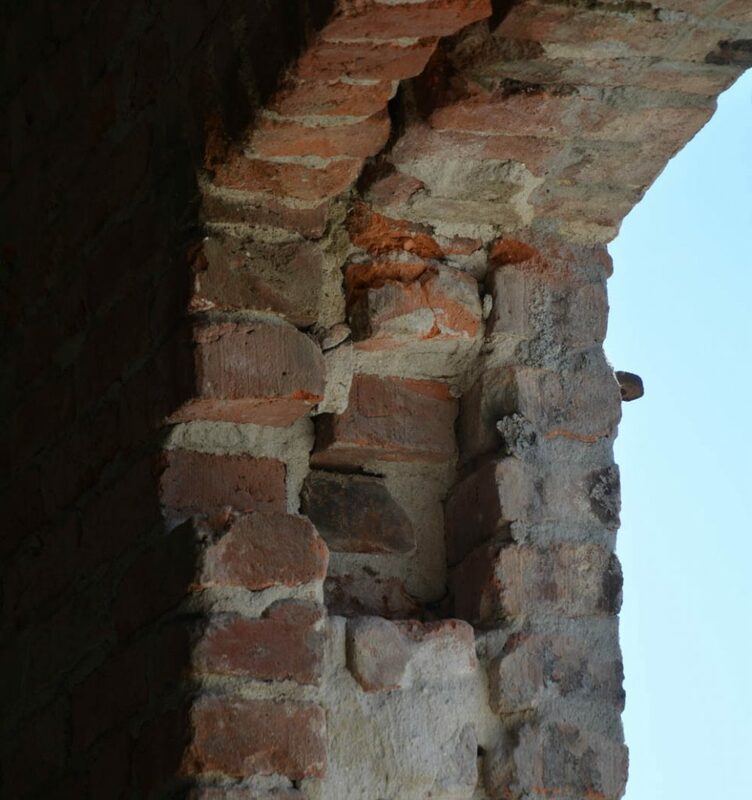 Now, it’s important to note that when restoring old brick masonry, modern mortars are too hard for the old soft bricks and can cause them to disintegrate over time. With this in mind, the mix that I use is similar to the old lime and sand but it also has a dash of Portland cement. 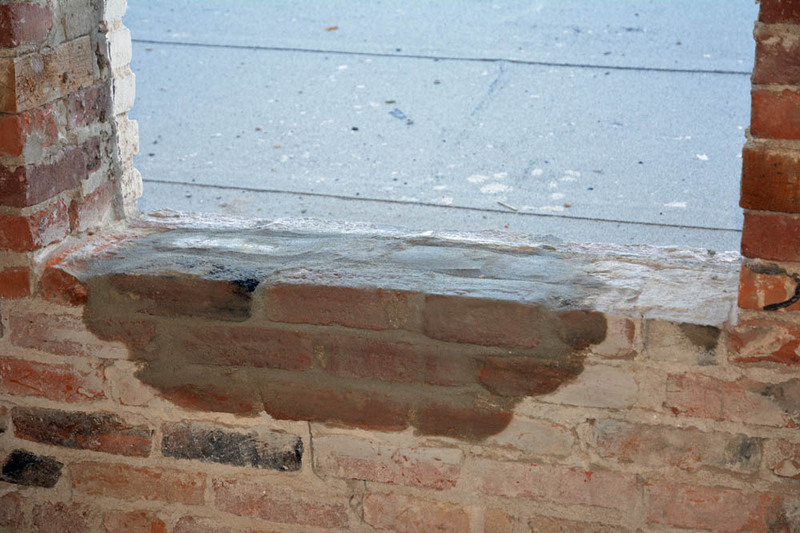 This creates a mortar that is soft enough for the old bricks but has added durability from the Portland cement. The repaired sills are probably good for another hundred years and maybe longer. 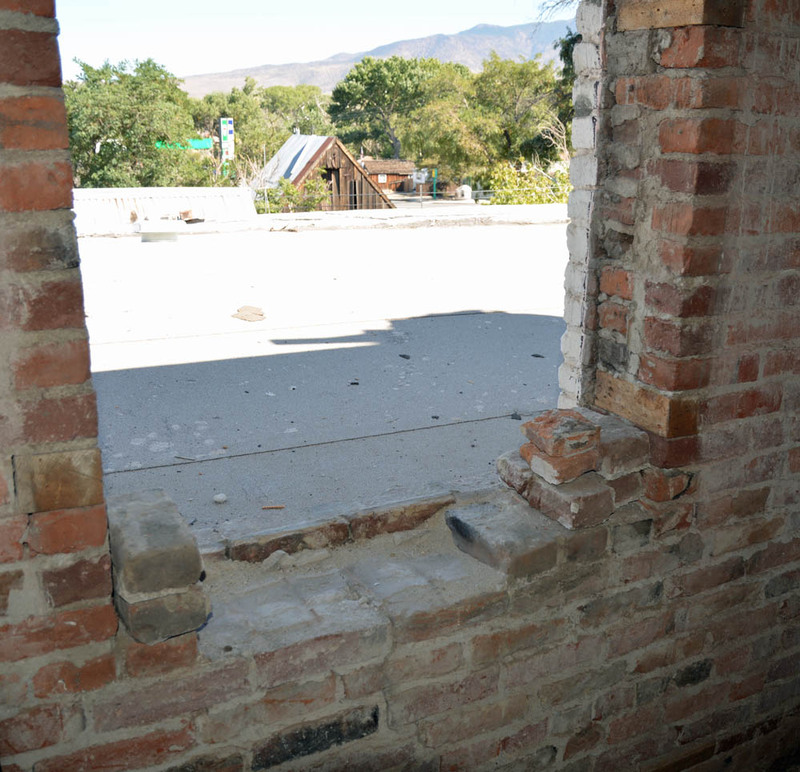 Another part of the window that suffered over time is the nailing blocks. These are wooden bricks embedded into the window opening so that the window jambs have something to attach too. Most of the originals were just loose and had to be pulled out leaving a pocket. With a bit of mortar, it was easy enough to put the nailing blocks back in for securing the new windows. As a beginning mason, all my handiwork will be covered by the window jambs and casings. Perhaps this is a good thing since I’m still working on making the work look pretty. In the meantime, I’m learning about mortar consistency, differing types of sand and protecting my hands from undue wear and tear. On this last point, I discovered the hard way that the lime used in mortar likes to eat skin. It’s quite irritating and where the skin cracks from dryness, the mortar goes subcutaneous and leaves little gray scabs that hurt for about a week. I now wear surgical latex gloves under rubberized cotton work gloves. This provides suitable protection without rendering my hands too clumsy for handling the mortar. With luck, the next post will have the new roof completed and walls installed on the first floor. Keep your fingers crossed.